Here in New York we have one more week until our kids go back to school. It’s that time of year when I feel like I want to get organized. I want to be efficient and and make plans that will help the school year get started smoothly. And, of course for me that means thinking about food! One of the biggest challenges I face is breakfast. Cold cereal is just so darn easy, and Rosa has a couple of favorite brands that are at least semi-healthy. But, I know we could be doing better on the nutrition front. I’ve learned from my work as food editor at Parents that I’m not alone with my breakfast quandaries. Our breakfast-themed newsletters and recipe slideshows always reach an enthusiastic audience. Plus, last spring I met with Rosie Pope, one of our contributing editors. She told me about her breakfast conundrums, and we brainstormed some solutions for her family… solutions that I think could work many other families as well, including mine. The key — as it often is when it comes to fitting home-cooked food into a busy life — is make-ahead. I developed five breakfast recipes for Rosie and her family. (Note: anyone can check out the story, but to click through to the recipes you have to register at Parents.com.) 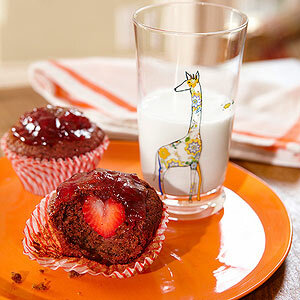 One of my favorite recipes is for these tender, fiber-rich Strawberry Surprise Muffins. Bonus: they keep well for a few days. What kid is going to resist a muffin with a colorful, sweet surprise inside? I know a couple of adults who can’t keep their hands off them either. This entry was posted in Blog and tagged breakfast, fruit, muffin, Recipe. Bookmark the permalink. I am going to go to Parents website right now and look at the recipes. I like things that are fast for breakfast too. Strawberries are Beans favorite! I will definately try these once colorado decides to cool off. I will registar at Parents too for more ideas.